A lot of people figure that a perfectly plausible explanation for the evil in the world is Satan, or maybe evil demons. The idea, I think, is that if Satan’s the cause of some misfortune, then it can’t be God’s fault. We know that Satan is evil, so there’s no incompatibility. But postulating Satan as the source of suffering and misfortune in the world really doesn’t make any headway towards reconciling those misfortunes with God’s existence. There are really only two possibilities here. Either God can restrict or prevent Satan from inflicting those gratuitous harms or he cannot. If he can and doesn’t, then we still have the classic problem of evil just as much as the cases of human caused or nature caused evil. Inserting Satan as a cause doesn’t absolve God when God, presumably, has the power, the knowledge, and the goodness to want to prevent such things from happening. If one vicious kid whose bigger than the others savagely tortures another weaker kid on the playground, it’s really difficult to argue plausibly that there was a teacher present who knew about it, saw it happen, had the ability to stop it, and is also a perfectly moral and just person. Something’s got to give. The critic might respond that God tolerates Satan’s inflicting these harms for some greater good. (Although you’d never accept that nonsense from the teacher who stood by and watched your kid get tortured by the bully.) That would be a different sort of discussion, and one that has gotten a lot of attention. If we’re going to discuss the likelihood or the possibility that all suffering that has ever occurred in the world is actually an indispensible means for achieving some greater good that God could not have achieved any other way, then there’s really no need to add Satan to the discussion. Doing so doesn’t absolve God of responsibility here because on this scenario God is fully responsible and intends for all of that suffering to occur. The claim that Satan is the immediate cause of the suffering doesn’t do anything to support the argument that God had a good reason to allowing the suffering and that the greater good could not have been accomplished any other way. If you think that all suffering is part of God’s plan, then Satan is irrelevant. If Satan causes gratuitous evil in the world, and God could but doesn’t prevent it, then God must not be omnipotent, or omniscient, or omnibenevolent. An omni-being could and would prevent it. So it would follow that there is no omni-being. The other possibility is that God is helpless to prevent Satan from inflicting all of that misfortune in the world. He would if he could because the things that Satan does are gratuitous evils, but God doesn’t have the power, knowledge, or goodness to stop it. But if we pursue this line, ironically, it becomes clear that there is no God. If a being is omnipotent, omniscient, and infinitely good, then that being would be able to prevent some lesser being from inflicting gratuitous harms. So it would follow that there is no such omni-being. And if there is no such omni-being, then there is no God. Maybe Satan is omnipotent and omniscient too, but infinitely evil, and God is deadlocked with him? First, notice that this view is a radical departure from most Christian, Jewish, and Islamic doctrines. On those views, Satan is within God’s dominion. God gives Satan permission to torture Job. Or Satan is a corrupt angel cast out from heaven. God is alleged to be the creator of all things—the whole universe. If there’s this other force that God cannot control, then we seem to have a very different sort of religious view, one that few people hold, and one that has a whole host of its own problems. Furthermore, all of the evidential problems that we have encountered regarding the existence and the nature of God will be as much or more of a problem with attempts to show that it is reasonable to believe that Satan exists. What evidence do we have, besides church doctrine, that such a wild fantasy being exists? If there is one of those, then couldn’t there also be elves, fairies, trolls, demons, ghosts, gnomes, goblins, and magic? Those things are all possible, I suppose, but are they really the most plausible explanation for events in the world given what we know? It’s frequently remarked that the world would be a much better place if the God hypothesis were true. Similarly, if there were a Satan and he was omnipotent or even just very, very powerful, then it seems like things would be much worse than they are. If you take the view from on high, there are bad things that happen to good people, good things that happen to bad people, and so on, more or less at random. There doesn’t seem to be any discernible pattern here that would suggest the existence of this elaborate supernatural pantheon. If we take the big view, the universe just looks ambivalent to our presence. Or at least it doesn’t look nearly as hostile as it would if there were a scheming, powerful, malicious being out there plotting to make you suffer as much as possible. So if Satan perpetrates some of the gratuitous evil in the world, then if God could prevent it, all of that gratuitous evil in on God’s shoulders. So if Satan perpetrates some of the gratuitous evil in the world, then there is no omnipotent, omniscient, omnibenevolent being. On the other hand, if God cannot prevent it because he lacks the power, knowledge, or goodness to do so, then again there is no omni-being. 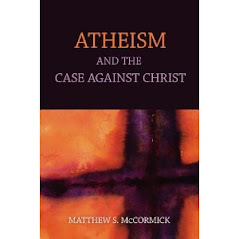 So rather than explaining away the existence of evil, the Satan hypothesis, if correct, would show that there is no God.